One of the questions we are often asked at the farmer’s market is what is the best potato for making gnocchi? 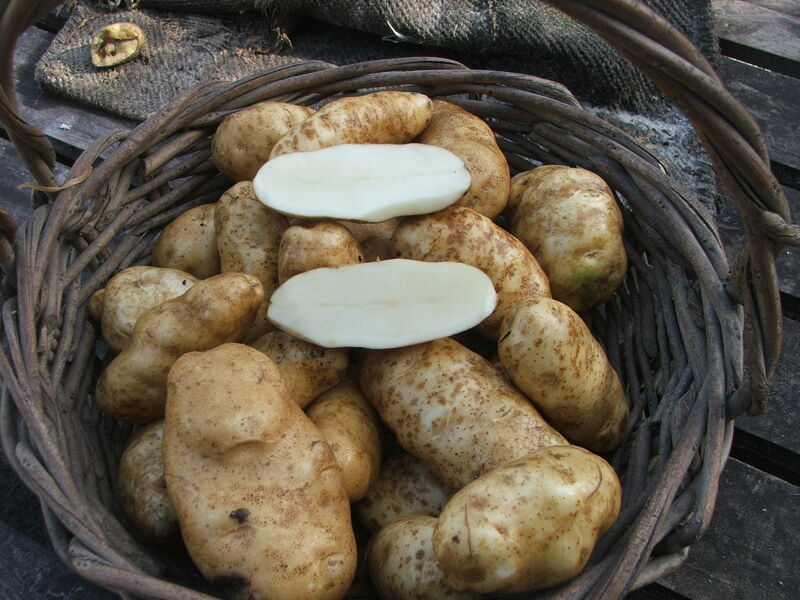 My own reading on the subject had confirmed that a potato which isn’t too floury or too waxy is best, but the specific variety of potatoes to use is often not mentioned in recipes, or may not be available. We grow around 10 potato varieties on Bathgate Farm, these range from waxy varieties such as Norland, Dutch Cream and Nicola to intermediate varieties such as Delaware and Royal Blue and floury and very floury varieties such as King Edward and Ranger Russet. Our friend Owen Cowdell, Head Chef at the White Star Hotel, Albany, is passionate about potatoes, and uses a range of our potato varieties on the restaurant menu, including a popular dish of home-made gnocchi. So we consulted the expert! Owen was quick to answer the question – Delaware is their first choice for gnocchi. For a demonstration and taste test Owen invited us to the White Star to see the Sous Chef, Shaun Barton at work. Shaun has worked extensively in Italian restaurants and making gnocchi is second nature to him. Shaun emphasised that a critical part of making gnocchi is the selection of the potato variety. He uses Delaware potatoes because they produce a fairly dry mash, which is light and fluffy, and they have the superior flavour of a waxy potato. He prefers to dry bake potatoes in the oven as this produces a drier mash. They are then peeled while warm and pressed through a sieve. Minimal working of the potato at this stage is required. A sieve (eg chinois or coarse sieve) or potato ricer is preferable to a potato masher, to produce a light, fine, lump-free mash. Once the potato is mashed, it is mounded together on the bench, a depression is made for the egg yolk. Flour, salt and any other seasonings are added and the mixture is kneaded to incorporate everything and produce a soft dough. More flour is added if the mixture is too sticky, although the finished dough is quite soft. It is then rested. Shaun pointed out it is important not to over work the dough. The dough is then rolled into long sausages and cut into short lengths. The gnocchi are cooked in a pan of simmering water until they float off the bottom of the pan (less than a minute). The cooked gnocchi can be added to a sauce or simply tossed in browned butter. Bake the potatoes in the oven until their flesh is soft. Peel off the skin with a knife while the potatoes are still hot. Mash or crush the flesh. Add the other ingredients and gently mix together while warm, being careful not to overwork it. The dough should not stick to your hands, add a bit more flour if the dough is sticky. Let the dough rest for 5-10 minutes. Flour a bench or chopping board, then in batches roll the mix into sausages about 1-1.5 cm thick. Cut these into 1.5 cm lengths with a knife. Separate and flour the gnocchi to stop them sticking. Carefully drop the gnocchi into a saucepan of lightly simmering water. The bubbles on the bottom of the pot will lift the gnocchi when they are cooked. If the pan is boiling too vigorously the gnocchi will disintegrate. The gnocchi will cook in less than a minute. They can be put straight into a sauce or simply pan fried in browned butter. Serve with a sprinkling of pecorino. Tasting the finished product with Shaun. This entry was posted in Potatoes and tagged Bathgate Farm, Delaware, Farmers market, food, Gnocchi, Italian cuisine, Potato on June 21, 2013 by jocelyn2013.